Happy Friday! I’m going to be working a loooooong shift today (probably 30 hours), so I decided I needed some amazingly fun nails to get me through! What are a few of my favorite things? 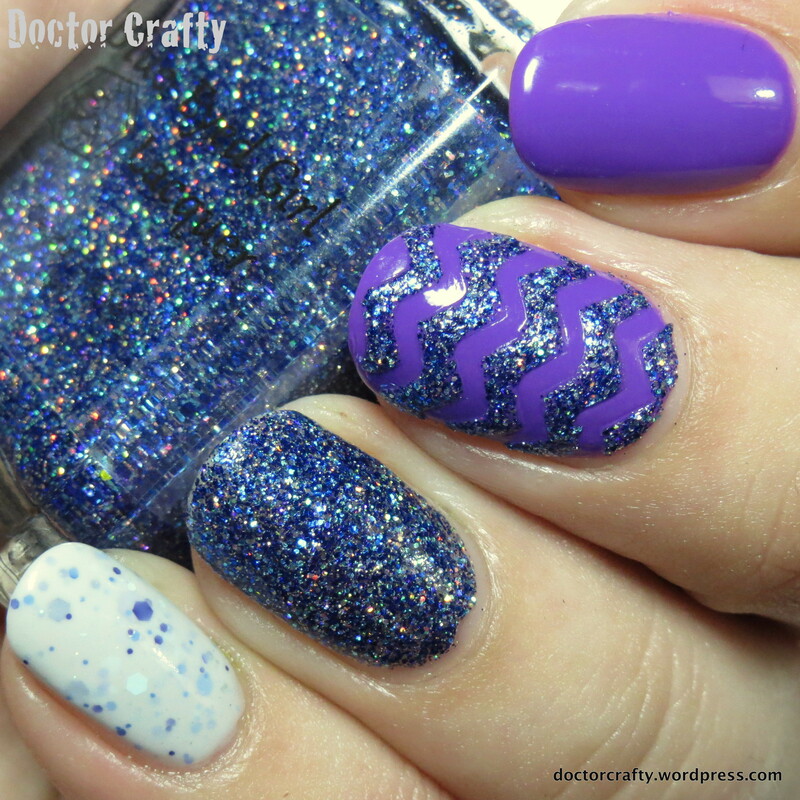 The 80s, Doctor Who, glitter, neon, and holos! So let’s put them all together in one mani, and what do we get? Mmm hmm – exactly what I thought! Throw some of my favorite polishes together, and you get a color scheme out of the 80s… perfection! I just love these all together (and separately)! Pinky (and thumb): China Glaze Glow With The Flow… This is another winner from the new Electric Nights collection. Perfect formula, AND it’s a true neon pink! I love this one so much. It’s going to be an absolutely perfect polish for my toes! Index: Blue-Eyed Girl Lacquer Mickey Smith, Defending the Earth… This is one of my favorite BEGLs of all time! It’s from her amazing Doctor Who collection (The It Got Away From Me, Yeah… collection), and it’s a GORGEOUS emerald green/ hunter green holo. LOVE! Mickey Smith is not my favorite character, but the polish based on him is a definite favorite! 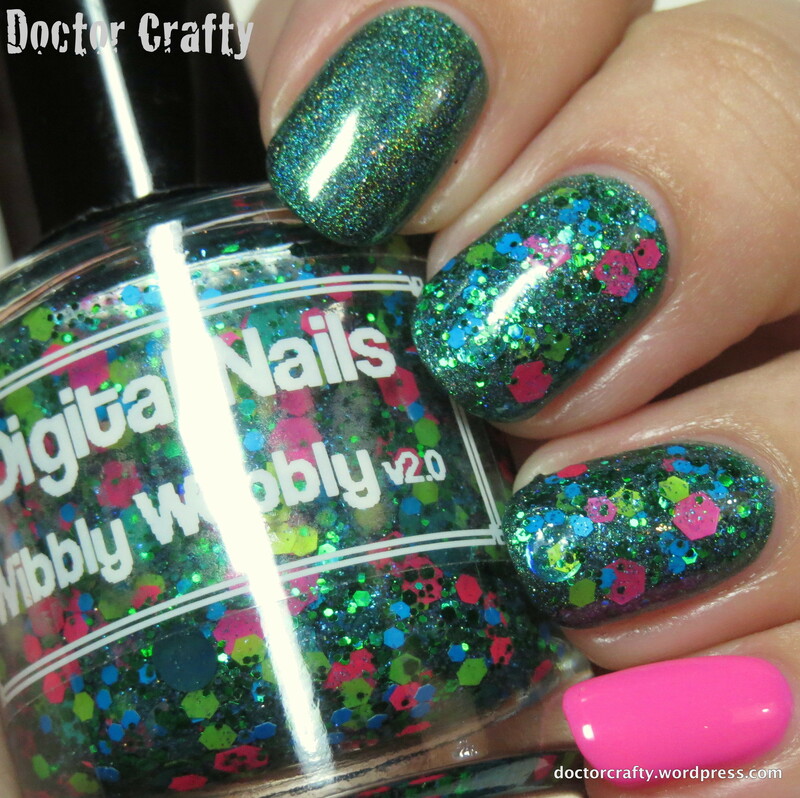 Topper: Digital Nails Wibbly Wobbly v2.0… This is a great glitter topper based on my favorite Doctor (Ten, duh!) 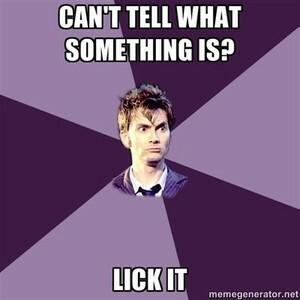 and his famous line from Blink about time being all wibbly wobbly, timey wimey. It’s a clear base packed with small emerald green hexes, matte chartreuse, neon pink, and blue glitters, and large blue holographic circles. The v2.0 just refers to it being a slight reformulation of an older version. I love this! It was so easy to get all the glitters out! I only used one full coat plus a little dabbing to get out a variety of glitter. What do you think? Does this scream 80s to you? If you did a mani filled with your favorite things, what would it look like? 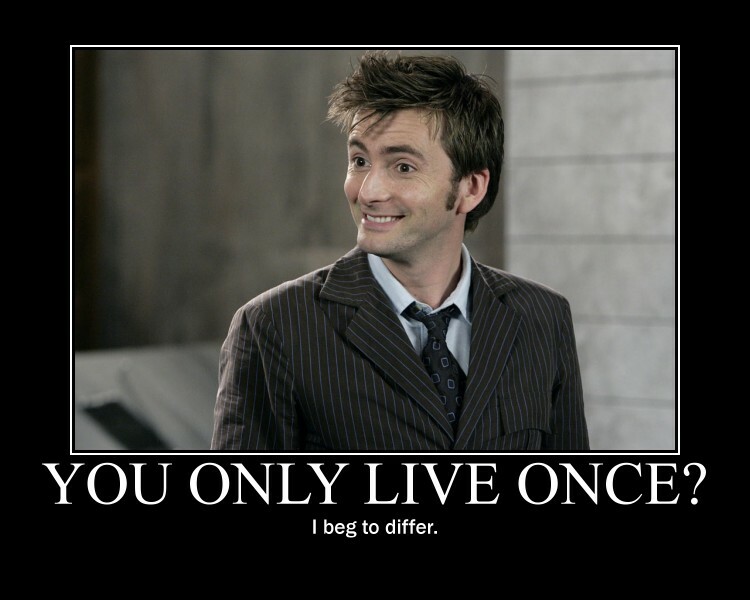 And now for your daily David Tennant! This entry was posted in Nails and tagged begl, begl mickey smith defending the earth, blue eyed girl lacquer, blue-eyed girl lacquer mickey smith defending the earth, china glaze, china glaze glow with the flow, digital nails, digital nails wibbly wobbly v2.0, glitter, glitter nail polish, nail polish, nail polish review, nail polish swatch, nails, skittlette on April 24, 2015 by doctorcrafty. Hello sweeties! Time for another manicure recreation! 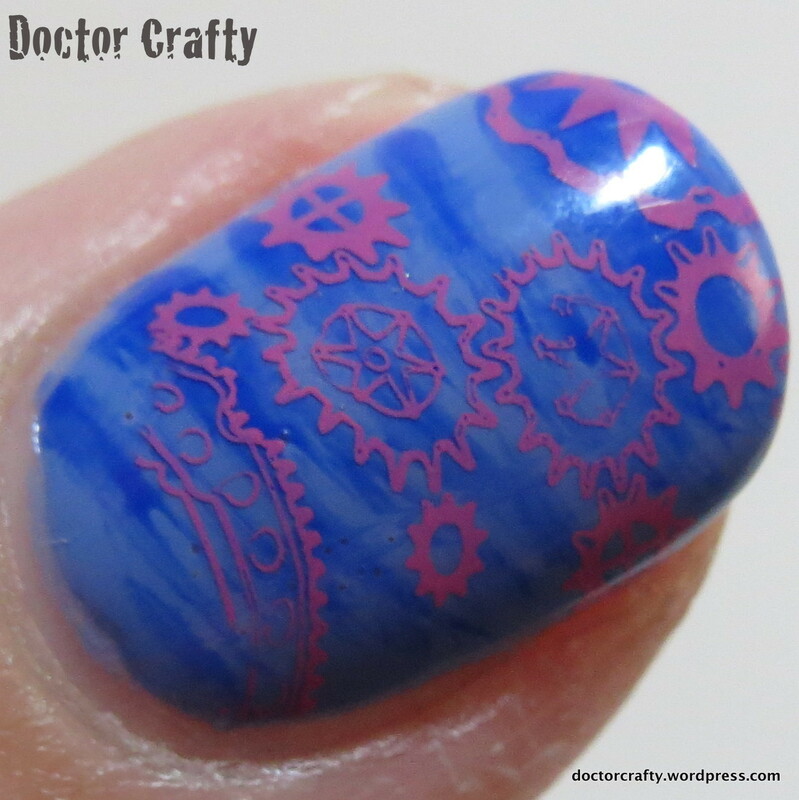 Today, I’ve chosen a gorgeous mani done by Lisa of The Polish Playground. She did this color blend mani (see her blog post here), which was before I joined the group. But I went back through old pics and found her version of a needle drag manicure! Ahhh I love Rocky Horror! I’ve been to many a midnight showing. Magenta used to be my go-to Halloween costume, and people who weren’t familiar with the movie/ play would think I was just some messed up french maid lol. I wanted bright, and where have I been going for bright colors recently? To the China Glaze Electric Nights collection of course! (wow I’m being super corny today!) I chose the bright red-orange neon as my base – it’s photographing more orange than it is in person. But it’s SO freaking neon! I love this one! Just wow, right?! So bright! 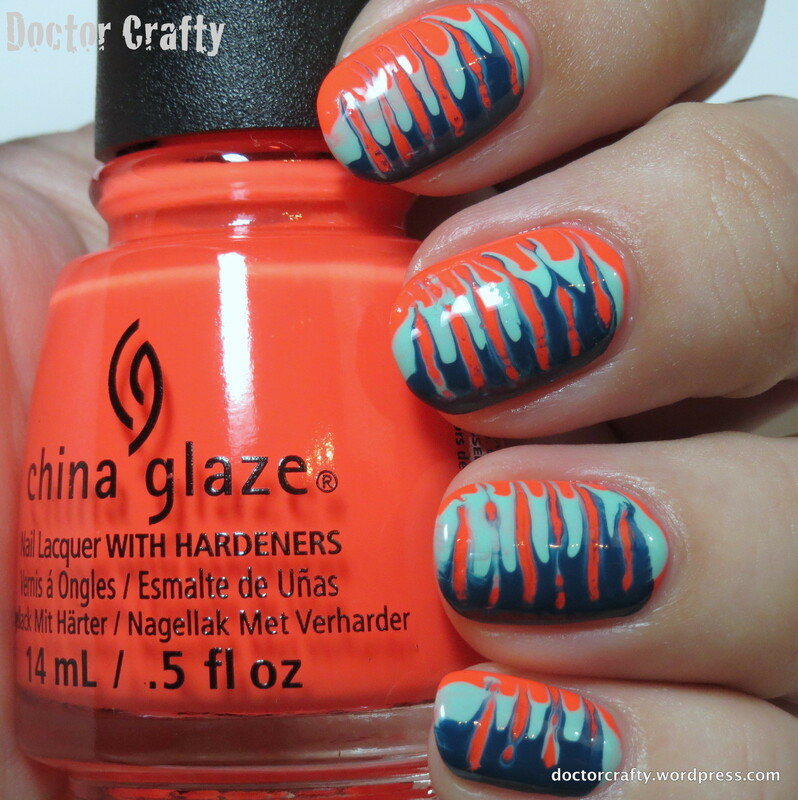 Base color: China Glaze Red-y To Rave… This is another one of the Electric Nights polishes. The formula is perfect (only needed 2 coats for opacity) and this neon red-orange coral is such a great color! Color Club Baldwin Blues… This is a gorgeous deep teal that I have in a mini bottle (I think I got it in some Birchbox a long time ago). Then I took the most narrow dotting tool and dragged it horizontally to blend them all. What do you think? Have you done this needle drag technique before? What color combos do you like to drag together? This entry was posted in Nails and tagged china glaze, china glaze red-y to rave, color blocking, color club, color club baldwin blues, manicure, nail art, nail challenge, nail challenge collaborative, nail polish, nail polish swatch, nails, needle drag, polish my life, polish my life 1950s mint fridge on April 20, 2015 by doctorcrafty. Hello sweeties! It’s Friday, woo hoo! I just got back from my vacation to SC yesterday, and I totally wish I was still there. It was so gorgeous down there, we got to see friends and family, AND we found a place to live! So it was a win all around! And now I only have to work one day, and then it’s the weekend. I really liked this one! It’s simple but with a little extra. Base color: China Glaze UV Meant To Be… Another one of the amazing Electric Nights! This one had a perfect formula (that slight uneven texture you see is actually from the top coat I used – Seche Vite). And the color is great! 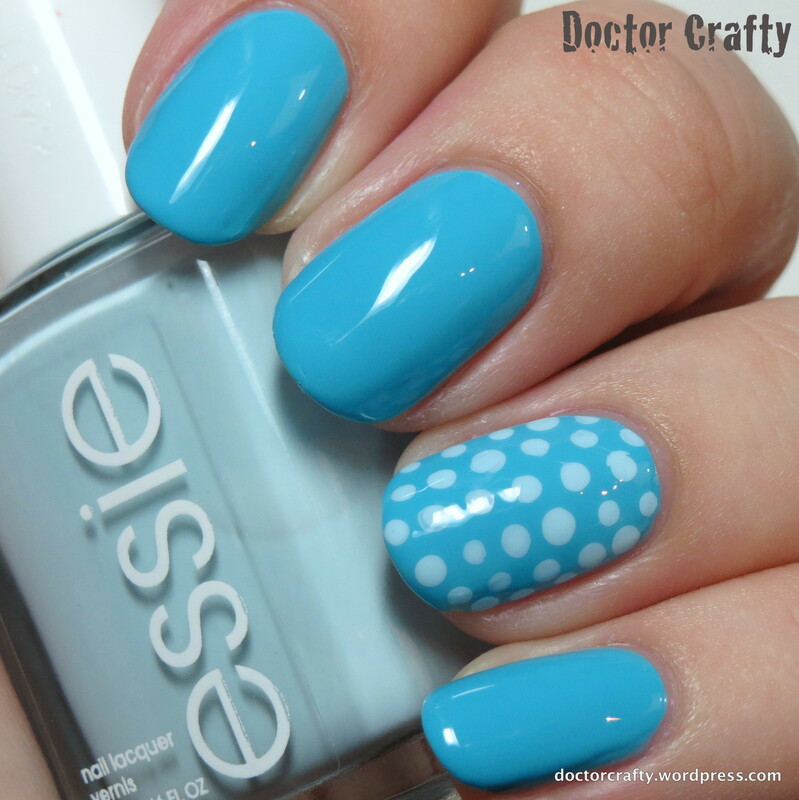 Dots: Essie Mint Candy Apple… Such a gorgeous light blue with some aqua tones! What do you think? What’s your go-to simple nail art look? 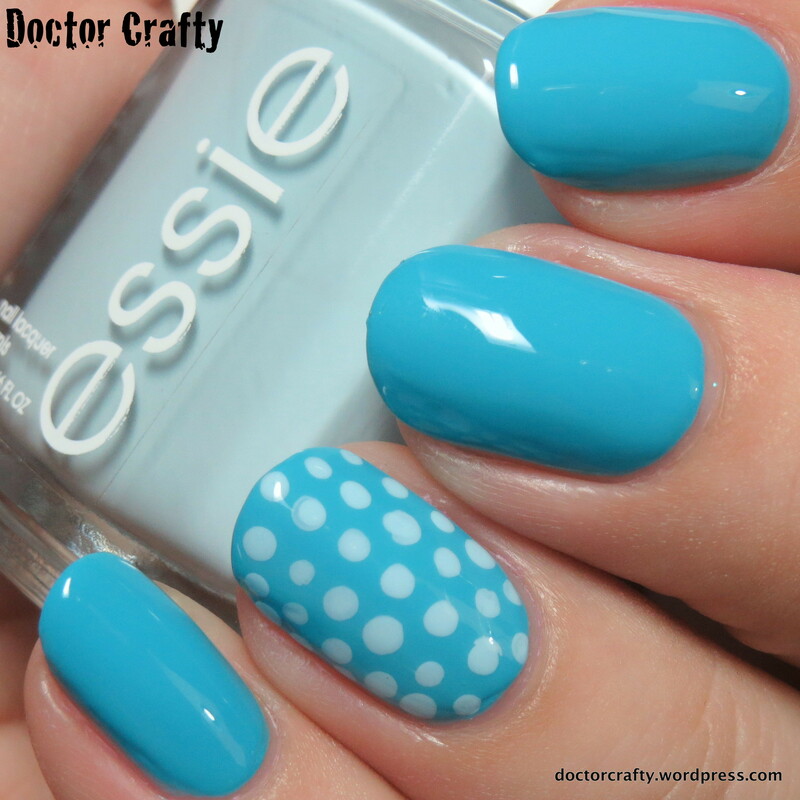 This entry was posted in Nails and tagged accent nail, china glaze, china glaze uv meant to be, david tennant, doctor who, dotticure, dotting, essie, essie mint candy apple, manicure, nail polish, nail polish review, nail polish swatch, nails on April 17, 2015 by doctorcrafty. Hello sweeties! For my second NCC look of April, I recreated a gorgeous manicure from fellow Pittsburgher, Stephanie of A Little Polish (see her blog post here). 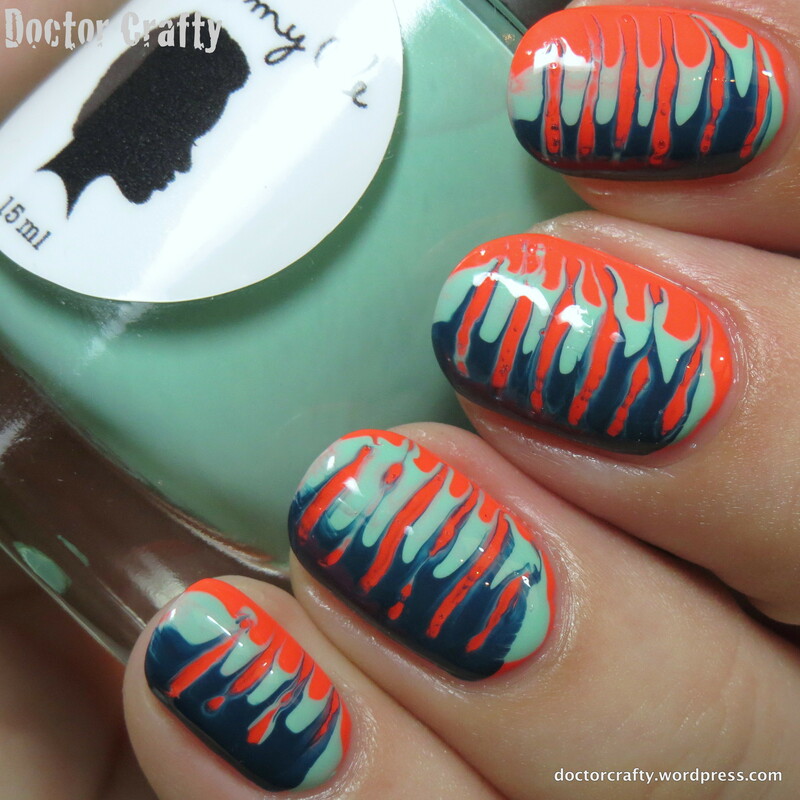 She did this beautiful striped gradient look for a neon manicure, and it really called to me! I’ve been feeling these fuchsia/ bright purples and pinks recently, and this mani fits so well with that. I love how this came out! It almost looks like a chunky neon tie-dyed manicure. Stephanie’s original was so perfect, and I think I came close at least in the color choice! I do wish I had left more of the darkest shade of purple showing. It’s just so pretty, and I had enough nail canvas to work with to get all the colors in. But I got overzealous with my white stripes*. 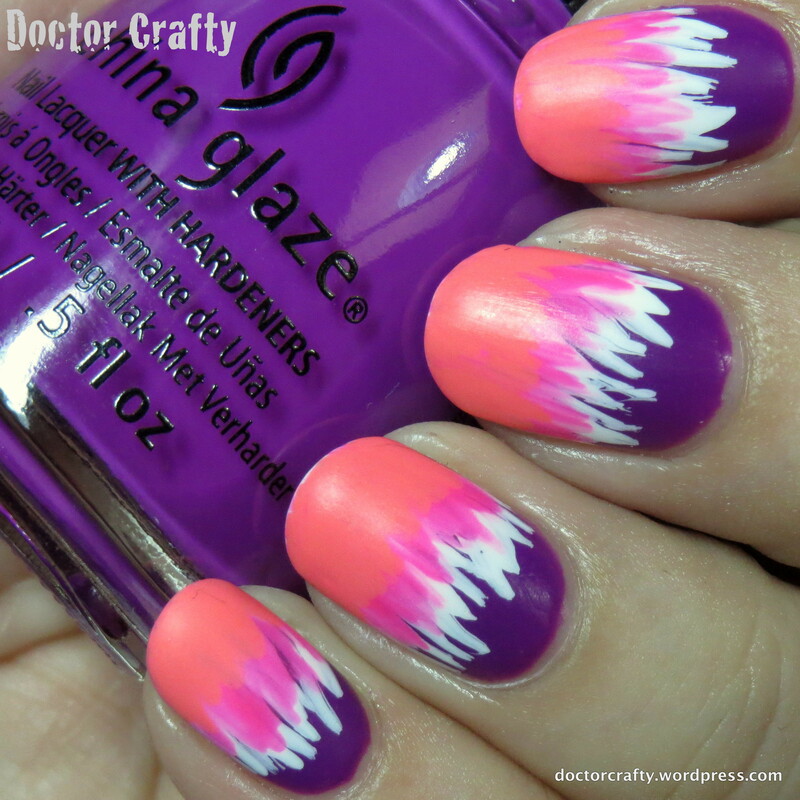 Base color: China Glaze Violet Vibes… This is a beautiful pink/red leaning fuchsia. It’s bright and vibrant and one of my FAVORITE shades of purple! Previously I had some issues with the formula (it tended to slide towards the sides of the nails and pool in those places), but this time I used thinner coats and had no issues. It did, however, take 3 coats to get opaque with this technique. I don’t mind because it’s my favorite shade of purple! First, a base of Rica Whiteout… The best white for nail art! Then KBShimmer Beach Please… One of my favorite names for a polish! And it’s gorgeous too 🙂 This is a neon purple-leaning pink, and it’s an amazing formula. LOVE! And lastly, Models Own Shades… One of the most amazing neon coral with slight pastel-leanings. It’s part of last year’s Polish for Tans collection, and it’s perfection! 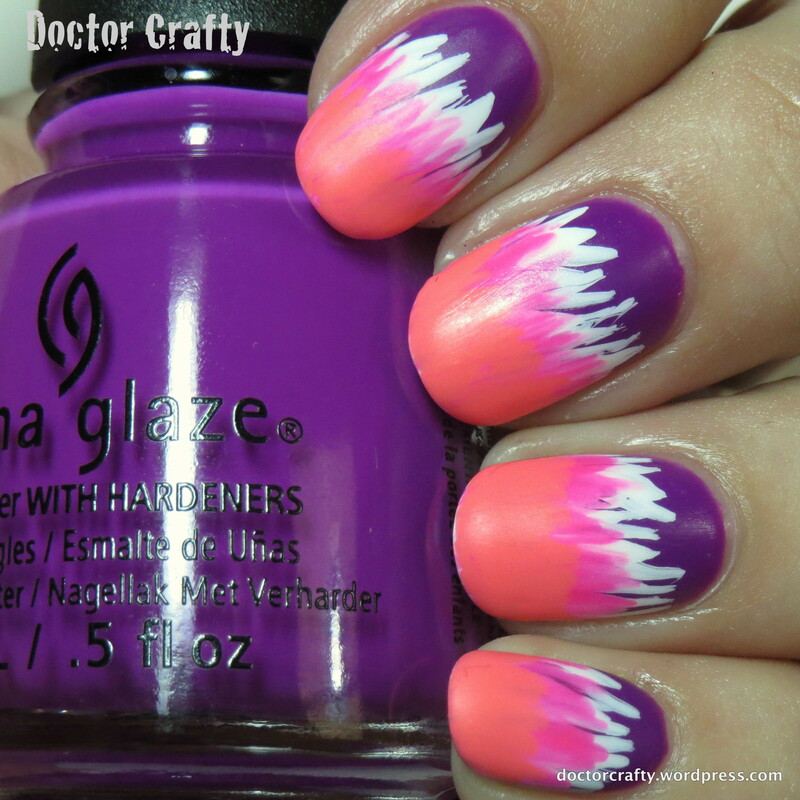 Top coat: Digital Nails Ain’t Nobody Got Time For That… one of my top 2 top coats! Matte top coat: Essie Matte About You… this is the only matte top coat I’ve tried, so I have nothing to compare it with. But it works just fine. What do you think? 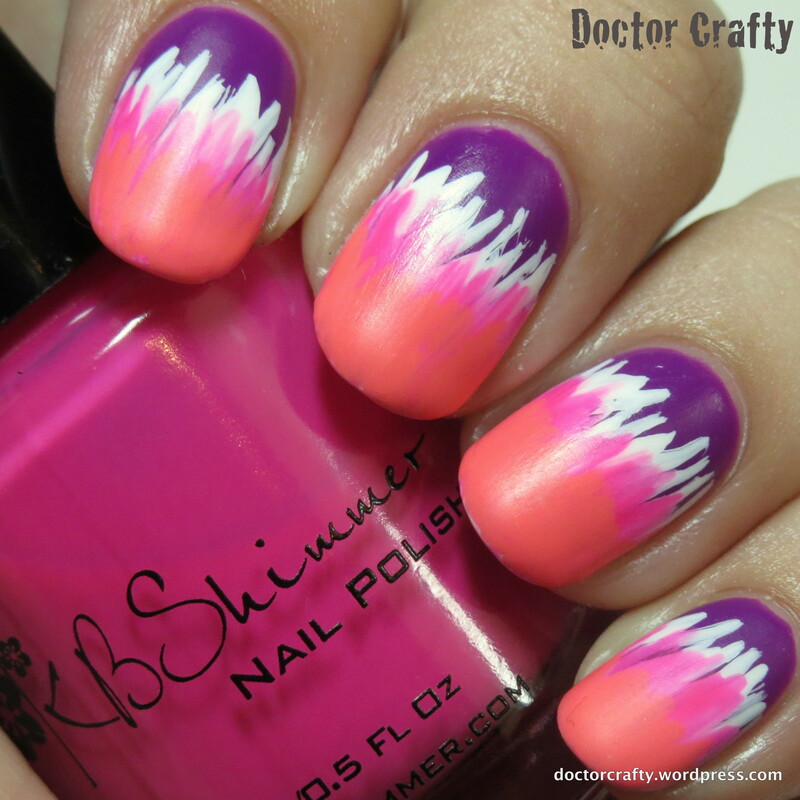 Have you tried a waterfall gradient like this? What colors would you combine for this? This entry was posted in Nails and tagged china glaze, china glaze violet vibes, digital nails, digital nails ain't nobody got time for that, essie, essie matte about you, kbshimmer, kbshimmer beach please, manicure, models own, models own shades, nail art, nail challenge, nail challenge collaborative, nail polish, nails, rica, rica whiteout on April 13, 2015 by doctorcrafty. Hello sweeties! While I’m away on vacation, I wanted to share with you a slightly older manicure of mine. It’s one of those “throw a bunch of random things together and maybe it’ll look ok?” type of manis, which I always love! And this mani involves glitter… also LOVE! The only issue with glitter for me – it gets everywhere and you’ll find pieces of glitter in random places 23 days after you’ve worn it on your nails. I swear I’ll pick off microglitters from my face way after it’s been removed! 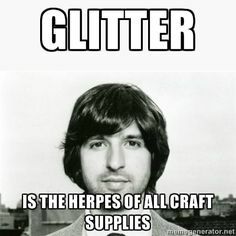 Demetri Martin had it right… damn glitter herpes! It’s the gift that keeps giving, whether you want it or not! Anyways, here’s my herpes mani? Nope… that sounds awful. Note to self – do NOT ever call a manicure your “herpes mani.” So, here’s my glitter chevron skittlette! That’s nicer, although it’s easier to call it a herpes mani LOL. Much prettier than herpes right? Geez, I need to stop talking about the herp! Just look at that purple! I really liked how this came out! I wanted to break out my chevron vinyls because it’s such an easy way to get a beautiful accent. And don’t all the polishes go well together?! When I’m choosing polishes to throw together, I tend to use one with multiple colored glitters or shimmer. Then it’s easy to choose the other polishes – I just take some of the accented glitter colors and try to match them! 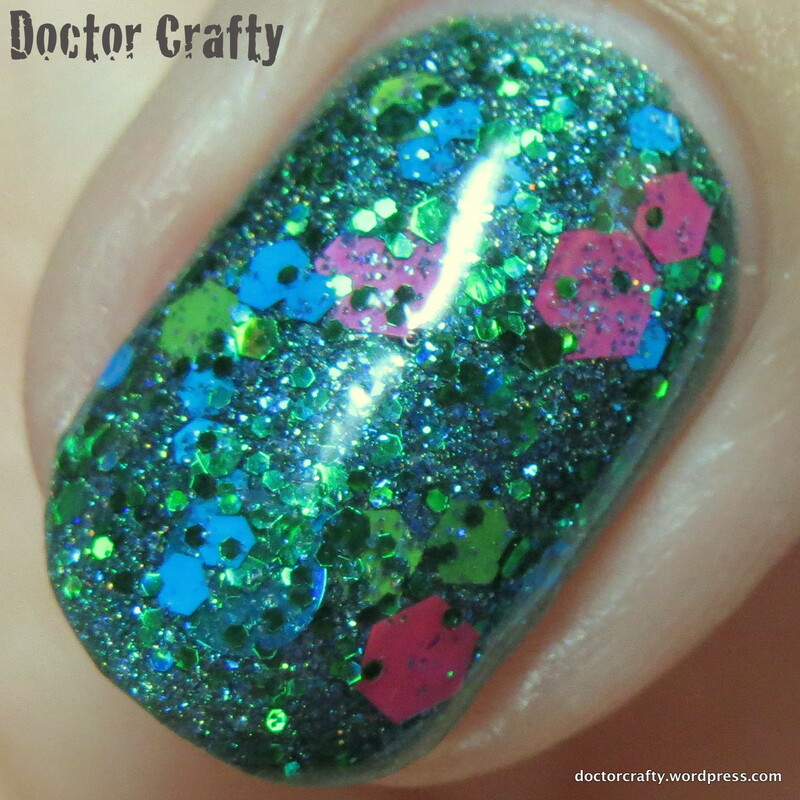 So for this mani, I first chose the KBShimmer crelly glitter Meow or Never. That polish has some purple and blue matte glitters, so I picked out a brighter purple and a blue glitter! Please excuse the yellowed cuticle area! I was playing around with a yellow chartreuse holo (which looked TERRIBLE on me FYI), and it stained like a mother. Love this SO much! Despite this being the offending glitter polish, I adore it! Index finger: China Glaze Plur-ple… This gorgeous purple is another from the new Electric Nights collection! The formula on this one was perfection (I had pooling/ uneven issues with the other purple in the collection), and the color is stunning! I LOVE this bright almost neon purple! Ring finger: BEGL 2000 Years… This stunning ocean blue microglitter has bits of silvery holo glitter interspersed with the rest, and I love it so hard! I used 3 coats for full opacity (I could have gotten away with 2, but I wanted the tips to be more opaque). It’s also part of Julie’s amazing Doctor Who collection (The It Got Away From Me, Yeah… collection), and it’s based on Rory and Amy, some of the Doctor’s companions. This name gets me in the feels – the love Rory has for Amy is something everyone should strive for! Pinky: KBShimmer Meow or Never… This gorgeous crelly glitter has a beautiful pale grey base that almost leans a bit purple. Matte glitters in dark blue, grey, purple, and light blue are packed in the base and easy to get on the nail. This was from the newest Spring 2015 collection, and it’s perfection! I used 2 coats. So that’s that! I think I mentioned herpes more than a Valtrex ad. Hopefully that didn’t turn you off and you stuck around for the mani! 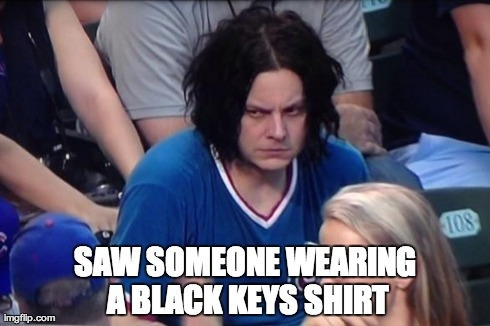 If you stuck around, what do you think? Do you like this kind of “kitchen sick” manicure where you throw a bunch of random things together? This entry was posted in Nails and tagged begl, begl 2000 years, beglove, blue eyed girl lacquer, blue eyed girl lacquer 2000 years, chevron nail vinyls, chevrons, china glaze, china glaze plur-ple, david tennant, doctor who, glitter, kbshimmer, kbshimmer meow or never, nail art, nail polish, nail polish swatch, nail vinyls, nails, skittlette on April 10, 2015 by doctorcrafty. Hello my sweeties! Are you excited for spring and warmer weather? I SOOO am! I need some sunshine in my life again soon! So while the PA weather gods won’t give me real sunshine yet, I need some brightness on my nails! I had been drooling over the extremely hard to find PipeDream A Night In Vegas neon cremes and after seeing that swatch video, I was really hopeful that the Electric Nights cremes would satisfy my neon craving. I realized I have gaps in my collection when it comes to neons. So I decided I needed to pick up a few of the Electric Nights polishes – specifically the purples, the pink, the red-orange coral, and one of the blues! So obviously I needed to use the neon I was anticipating the most – the fuchsia purple neon! 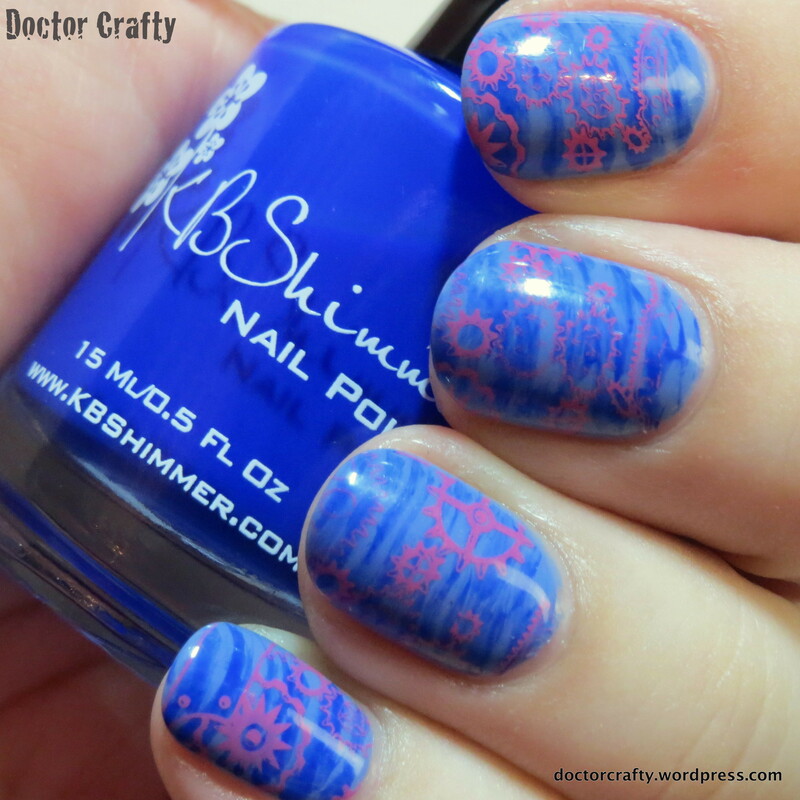 This is what I came up with – another little mishmash mani! I love how coral and fuchsia go together! Especially when they’re as bright as pretty as these two! I have to say, I adore the color of this China Glaze neon! But I don’t think that they’re a replacement for the PipeDreams – from everything I’ve seen and read about those, they have such a perfect pigmented formula. The formula on this particular polish was a little runny. It does get opaque in 2 coats (without a white base), but the polish tends to slide towards the sides of the nail a little bit. I think a 3rd coat would fix that issue. And, ahem… do you see the pinky nail?! That topper is divine! It’s one of I Love Nail Polish‘s new holographic multichrome flakies. AND I was able to get some good photos of that little sucker! BOOM baby! I got it! I may have wished on a star, stood on my head, and sacrificed a virgin… but I finally got a good picture of the multichrome flakie! It shows off the gorgeous shift from pink/purple to gold and green, AND you can see how much depth the scattered holo gives it! Yay! 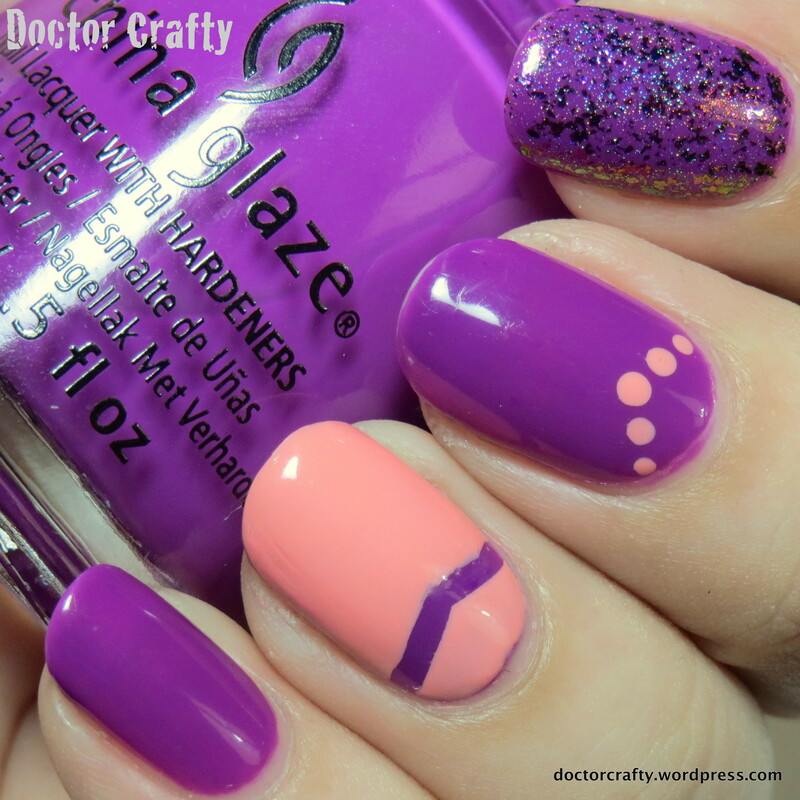 Base color for all nails: China Glaze Violet Vibes… as described above. Hopefully the formula of the others I bought are a little better. But I’ve most definitely come across worse neon formulas for sure! Oh, and since I hadn’t seen this collection in stores yet, I bought mine on Head2Toe Beauty. Topped with ILNP Neon Rosebud (holo version)… check out the closeup shot above to see just one coat of this beauty! The holo in the flakie topper does give the base polish you use a bit of a silvery tinge. But only a little bit. 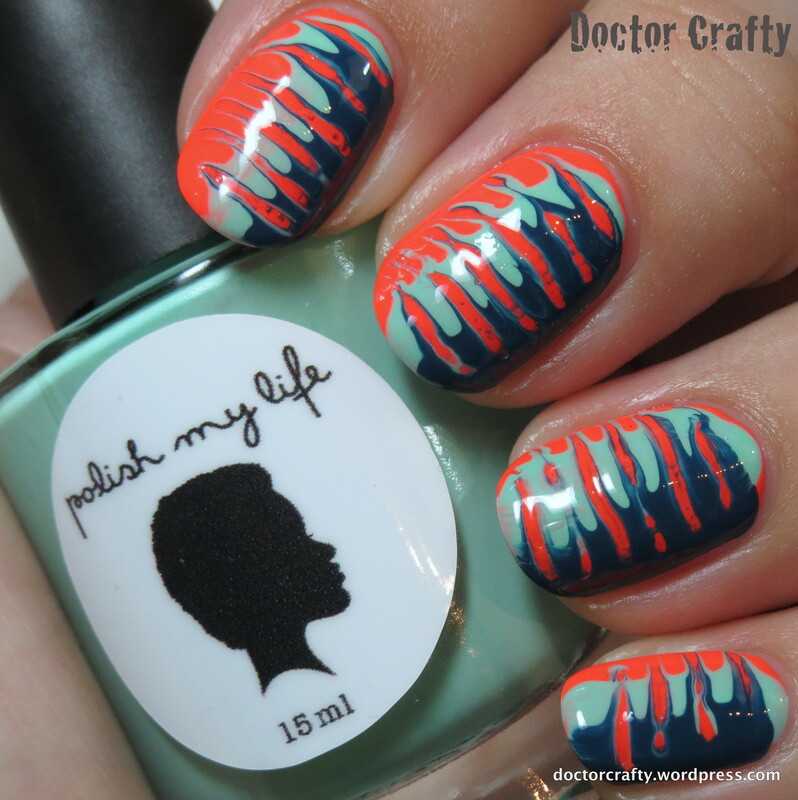 Dots of Polish My Life Coral Fedora… this is a gorgeous pink-leaning coral that’s a very bright pastel. The formula on this is perfection! I have yet to come across a bad Polish My Life pastel. They all have amazing formulas and are so pretty! I used a chevron vinyl from NailVinyls. What do you think? Do you have the PipeDream neons? Or do you know of dupes? 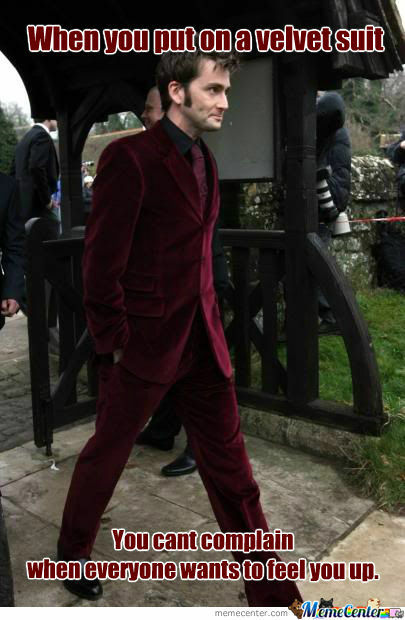 And now for your daily David Tennant! This is from the amazing Girl in the Fireplace episode!! This entry was posted in Nails and tagged chevrons, china glaze, china glaze violet vibes, doctor who, dotting, flakies, holo, holo nail polish, holographic, holographic nail polish, holographic nails, I Love Nail Polish, ILNP, ilnp neon rosebud holo, jessie spano, manicure, nail art, nail polish, nail vinyls, nails, polish my life, polish my life coral fedora, saved by the bell on March 27, 2015 by doctorcrafty.